A contact lens is a small, shell-shaped piece of eyeware used to correct vision. It is placed directly over the cornea (the transparent, or clear, tissue over the pupil and the iris, or colored part of the eye). There are two types of contact lenses. One is the corneal contact lens which covers only the cornea, and the other is the scleral contact lens, which covers the cornea and a part of the sclera (the white part of the eye). The contact lens is held in place by fluid attraction forces. These forces are easy to demonstrate. If two pieces of glass are placed together with water between them, it is easy to slide the pieces back and forth. But separating the two pieces of glass is very difficult. Today contact lenses are made from plastics and gels, but the original contact lenses were made of glass blown by glassblowers. It is hard to say when the idea of a contact lens was born. Leonardo da Vinci (1452-1519; Italian painter, scientist and inventor) knew that glass and water affected vision. He sketched and described several types of optical devices demonstrating the principles of a contact lens. The first description of what was needed to make a contact lens was given by Sir John W. Herschel (1792-1871) in 1823. Three Europeans are generally credited with the invention of the contact lens: Adolf Eugene Fick, Eugene Kalt, and August Muller. In 1888 Fick described the first contact lens with refractive power (the ability to change vision by bending rays of light). Fick's "contact spectacle" was a thin, very small glass bowl. This bowl was placed on the eye, and the area between the bowl and the eyeball was filled with a liquid similar to tears. On March 20,1888, a scientific paper was presented in Paris. Delivered by Kalt, the paper described a lens he made to treat keratoconus (a condition of the eye in which the cornea is cone-shaped; normally the cornea has a convex, or bulging outward, shape). Kalt's lens worked by pressing down on the cornea and making it flatter. This improved vision. When plastic contact lens were introduced, they were similar to Kalt's contact lenses. In 1889 Muller, a medical student at the University of Kiel in Germany, started his work on contact lenses. He was very myopic (near-sighted). His lenses were made to more closely match the curvature of the cornea. He knew they would be held in place by the tears between the lens and the cornea. Between 1920 and 1940, the Zeiss Optical Works of Jena, Germany, and the Mueller Company of Wiesbaden, Germany, were making glass contact lenses. There were problems with eye irritation, however, and it was not possible to wear these lenses very long. Joseph Dallos understood that tears needed to pass between the lens and the cornea. Eventually it would be discovered that, because the cornea does not have its own blood supply, tears bring nutrients to it. Also, because it has no blood supply, the cornea must get its oxygen from the air. The first disposable lens was introduced by the Johnson 8 Johnson Company in 1987. 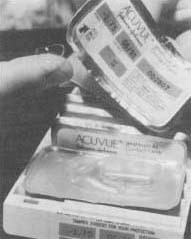 Sold under the brand name Acuvue, the lenses were designed to be worn for up to one week, then thrown away. In 1936 William Feinbloom made the first contact lenses with plastic. These lenses were a hybrid (combination), however, of both plastic and glass. Feinbloom was also the first researcher to file a patent for bifocal (adjusted to two different focal lengths) and trifocal (adjusted to three different focal lengths) contact lenses. In 1936 the Rhom and Haas Company introduced a new, transparent plastic material called polymethylmethacrylate (PMMA). This material would be the main plastic used in contacts for the next forty years. In 1938, John Mullen and Theodore Obrig developed a technique for making scleral contact lenses with PMMA. In 1948 Kevin Tuohy was the first person to make a corneal contact lens when his lab partner accidentally cut away the scleral part of a contact lens in production. Tuohy discovered that he could wear just the corneal part of the lens. There were still some problems, however, with making the contact lens fit properly. In 1950 George Butterfield changed the way contacts were made by creating a lens with different curves on the side of the lens next to the eye. This made the contact very similar to the cornea. The hydrogel lens is made of very pliable chemicals. It does not cause very much irritation to the eye. The idea for the hydrogel lens started with Professor Otto Wichterle, a polymer chemist from Czechloslovakia. Wichterle and one of his assistants created a material called hydroxyethylmethacrylate (HEMA). The researchers found that this material caused little irritation to the delicate tissues of the eye. In 1957 Wichterle tried to make contact lenses in a mold using HEMA. Unfortunately the lenses were too thick, and they often tore when anyone tried to get them out of the mold. Eventually, Wichterle was told that he could not get any more money for his research, so he continued his work at home. Over time, he was able to produce contact lenses that were thin and easy to make. In 1972 the Bausch and Lomb company introduced a hydrogel lens that has almost replaced the hard contact lens completely. In addition to their cosmetic applications, contact lenses offer several medical advantages over eyeglasses. When cataracts (a disease of the lens causing it to get cloudy) are removed, contact lens are more effective than glasses in restoring sight. Unlike glasses, contact lenses can improve the vision of people with keratoconus, and they also allow people to play sports without having to woffy about breaking their glasses. i am in high school writing about the invention of contact lenses and i was wondering who is the author of this article? Love the dental content on your site! You know, most businesses get traffic from their blog, and we feel that you could use a little boost, since you are not blogging weekly yet.